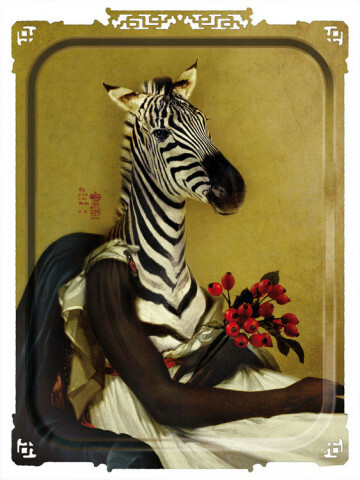 Europe's kings and queens were never represented so brilliantly nor paid more homage than the stunning animal portrait trays of Ibrides Rachel Convers. Though waterproof and dent-resistant, you might be in for some criticism if you actually allow a drink to be placed on one of these trays. 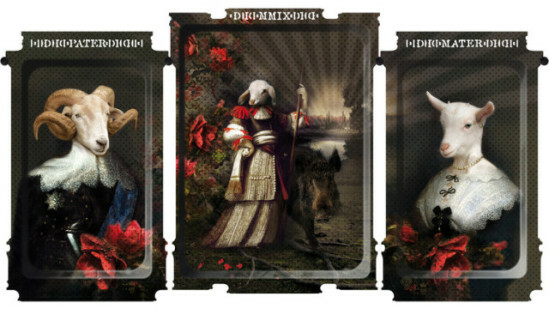 Whether viewed on a table or a wall, Convers' eccentric portraits are so finely accomplished that they do indeed exalt the bird and the fox and the goat to the hierarchy of the aristocracy. And though the portraits will evoke smiles, and giggles, and even laughs-out-loud, they are because of how comfortable these animal creatures are in our manners and attire. Are they laughing at us? 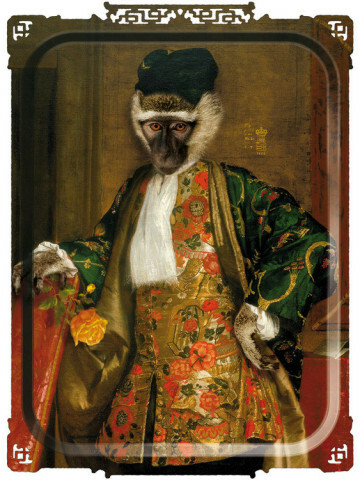 Each wild animal brings his own natural character to the painting as Convers morphs the animal into a noble, a princess mother, a Mongolian emperor, or a Pope! Her colors, rich and vibrant, jumping out at you like the shiny moist oils of a canvass. 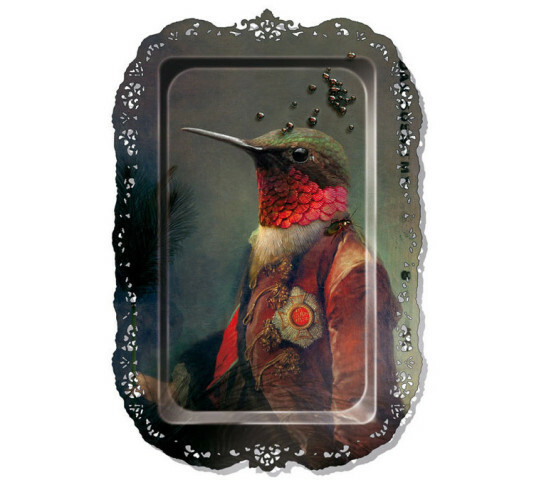 Even the doily-like tray rims (or portrait frames), delicately machined into the laminated wood, conspire to evoke the nostalgia of the Romantic period. Take a "gander" at some of Ibrides (sic 'hybrids') remarkable "Tray Stags." 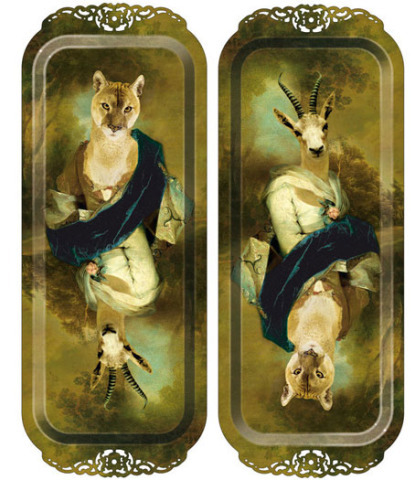 These and more of Ms. Convers animal trays can be purchased at Made In Design. If you wish to see more of the Convers family designs, visit the website Ibrides. 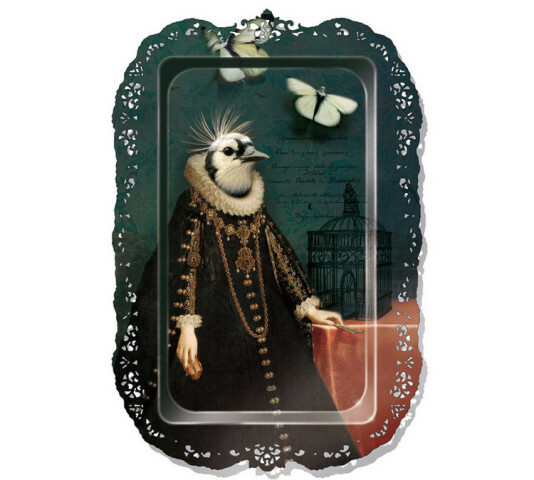 Amazon also carries many iBride animal items here.